When you run start_embedded_server.bat, it opens a DOS shell. The only other time we've seen someone have a problem with this, they closed the DOS shell, which of course kills the server process. Did you do that? Please describe in more detail. At what point in time do I need to close the DOS shell? Doesn't the SDK Explorer stop being available after the process is closed? Or are you asking - have I closed the server window? Last edited by fromchaos; 14th Jan 2019, 08:36. Yes, we asked, did you close the server window? You should not. You've got an except at startup, which looks like some sort of XML parser issue. Did you really *just* run the batch file or did you move some files around perhaps? We need to see the full exception, and also know your Java version. 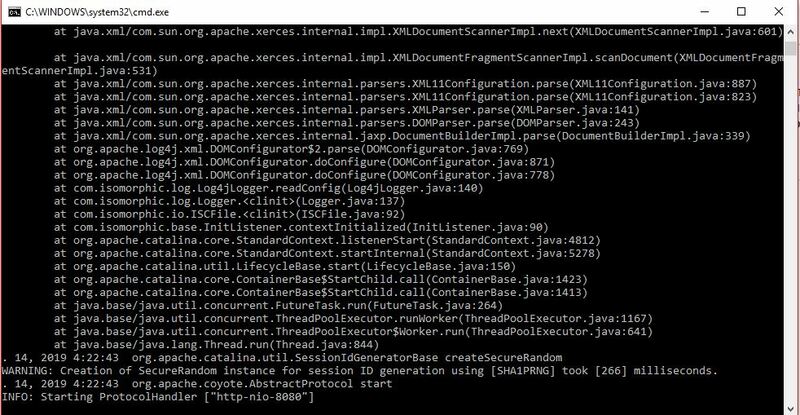 We also need to see the logs, if any, that you have when you attempt to hit the server - it would be sufficient to just go to http://localhost:8081/isomorphic/IDACall. This should fail, but the logs may show a problem. No server window, I did not close. After your message, I moved the folder "SmartClient_v120p_2019-01-12_LGPL" to the root directory C: \ SmartClient_v120p_2019-01-12_LGPL - after which, the output in the console changed below will provide a screenshot of the entire output in its entirety. Problem still exists. I will also attach a screenshot after the address "http: // localhost: 8081 / isomorphic / IDACall". Can you tell me where can I find logs? The logs are in the console. Now there is no exception, but you had one before... you seem to be doing some additional things we're not being told about, as this process is about as bulletproof as it can be made. However as far as your originally described problem: you've downloaded the LGPL edition and this does not include Visual Builder. 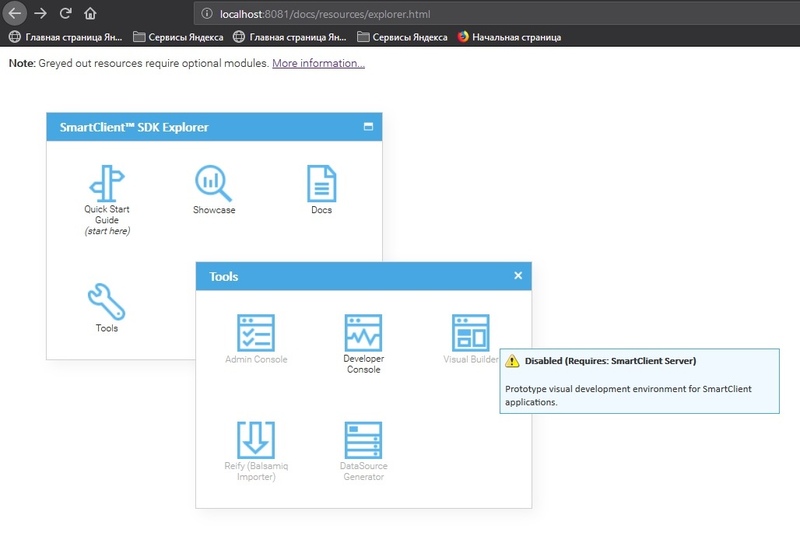 Please also note that Visual Builder is not an IDE, but a tool aimed primarily at non-developers. Starting with Visual Builder is not the right way for a developer to evaluate the product, start with the QuickStart Guide instead.